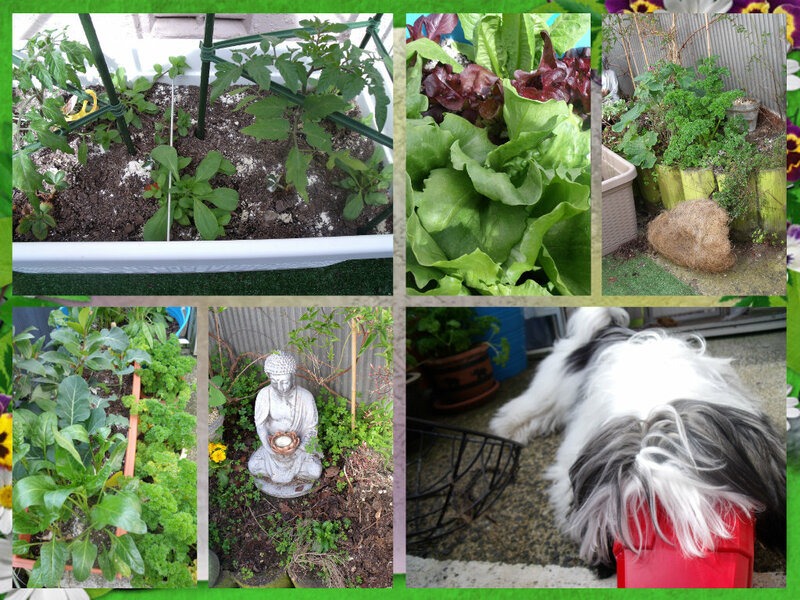 This entry was posted in Daily Life, Random Thoughts and Quotes and tagged Charles de Lint, gardening, magic, poems, Serendipity, Siddy the Shih Tzu X, Spring, WB Yeats by thecontentedcrafter. Bookmark the permalink. The magic of it all! A lovely post. I have loved that Yeats poem for a long time, and it still moves me whenever I come across it. Thanks for sharing it. Pauline, I too have so many things in various stages of completion and look forward to getting back to them. It’s good to hear Orlando is doing better that must have been quite a scary period for you. Just so glad I went backwards to see if I had missed a post. This is lovely. I would give myself a break, though! You were gardening and enjoying the summer time, along with maybe feeling like you were ‘on vacation’ from writing. I am so glad another blogger, (nice name, ha ha!) got you spurred on with Yeats and her own personal magical poem. I loved this description of how she would spread magic, feel magical! Yeats and A.A. Milne… fine choices of words of wisdom and light. My Mom liked the days when memorization was part of the curriculum. She can still recite poems and passages of books, but forgets (3 x or more) that she watered the same indoor plant, until it spills on the carpet. I am smiling not complaining. The Light Brigade and poems of oceans are her favorites, recently. Just stopping by, my Mom got up for Sunday breakfast, (she and one of my brothers are ‘night owls,’ in our family.) Anyway, she absolutely loves your Siddy photos! Pauline, I went back and showed her your puppy photos, too! 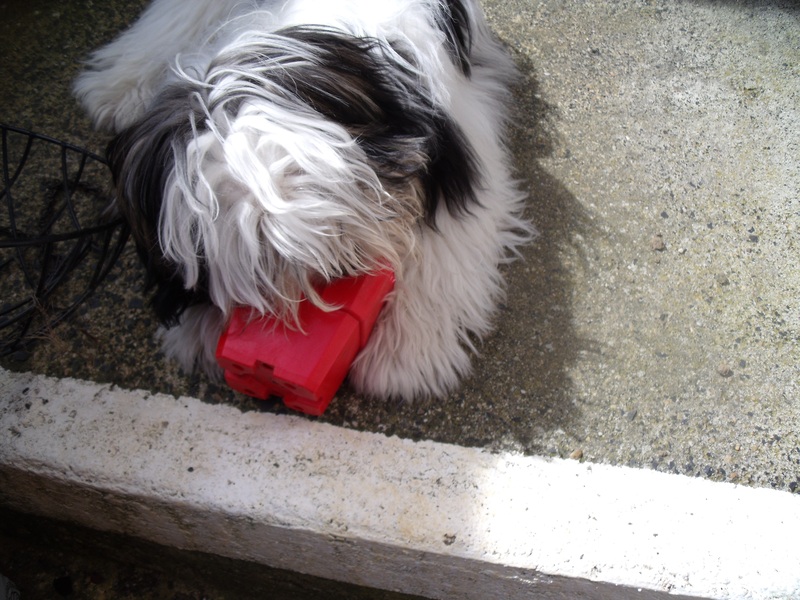 The time when Orlando was watching silly Siddy take out his toys, growl and shake them, trying to get him off his haughty perch, to come and play! So adorable! Take care and appreciate your thoughtful comment, along the way this week! This was a very nice message to wake up to Robin. It makes me very happy that your mum enjoyed my Siddy and Orlando’s carryings on. These two are my versions of ‘grandchildren’ as I have not been blessed with any – so you can imagine how loved and cosseted they are! Thanks again for sharing – it really makes me smile! 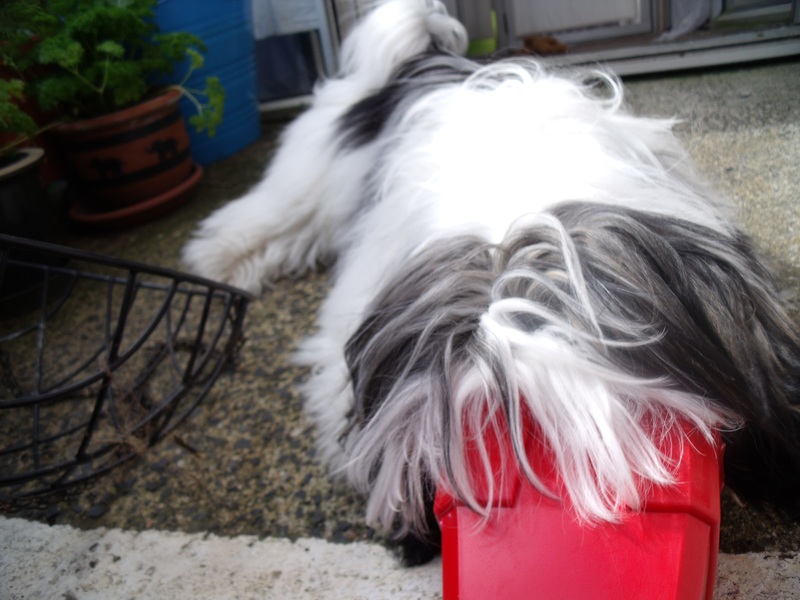 Plastic pots and pottles are a great favourite of young Siddy – he now upends and scours the recycling bin for anything that might possibly be chewable or edible or playable with in the way of plastic pottles………. I am beginning to feel obliged to find more plastic as I don’t actually have that much around. I suppose it is helpful for the recycling effort – the plastic is greatly reduced in mass and sometimes disappears altogether …… oh dear! I am a little upset with my ‘neighbour’ [I put that in quotations as there is nothing neighbourly in what he does] as I have asked him not to spray on my part of the property and also to warn me when he intends to spray so I can keep Orlando inside. But he doesn’t follow either request and my poor boy gets quite sick from his poison. I am relieved when he throws up as he clears his system out and has a good sleep and gets better. This one was quite spectacular though. Luckily I was aware he wasn’t feeling too good and was keeping an eye on him and got him to the bath tub in time – I was really really glad he was in the tub!! 🙂 He is back on form now. I see you are enjoying your garden [and working so hard – much admiration!] My little effort pales in comparison, but I am already picking spinach and lettuce leaves for my evening salad 🙂 Love it! Yes to the neighbour – sadly! Great Scott Dani! That is extremely kind and fullsome praise indeed – you have to remember I only respond with what I am inspired to think and feel when reading your posts – I can only be all those things when all my blogging friends are being so as well! We are a lovely magical circle of friends I think and I have been made very happy by the mere fact that everyone who has responded here has got what I was saying and knows it for themselves. Goodness Pauline, I don’t know where to begin! Your post was wonderful to read (you have such a lovely way of expressing yourself) and I’m so thrilled for the excitement and motivation you have found. Even better was reading through all the comments. You are well loved indeed, Pauline, and that’s because you give so much to others. I feel I have been extremely fortunate in the people who have gathered about me here in the great blogging www Laurie – you guys all offer me so much and it always lifts me up and makes me a better person for a short while. 🙂 I have simply become aware of the magic that is always here. My goodness, Pauline, what a powerful, enlightening and personal post. I can see by all the comments preceding mine, that you’ve touched many. I echo their words, too: you are magic, and you spread magic with your warmth and humour, your art and craft, your sage advice and knowing ways. I’m delighted to hear you’ve arrived at such a powerful place. I can hear the joy and the energy in your voice. Spring comes and goes Alys – some days really warm and others really cold. Today it can’t quite make up it’s mind. I have one more planter box to finish planting up and no more room 🙂 The front step is about to get vegetated! This is such a moving post. I love that the way forward has opened up to you. And by the way, I think that both reading and writing blogs can help open one’s mind to the magic around us. I remember Lucy (Attic24) talking about how much more aware she is of the changing seasons and colours since she started blogging. That’s a wonderful thing, surely? On a more sober note, I’m sorry that Orlando has been so ill. Big hugs to him from afar, although I’m sure his feline dignity would prevent him from accepting them. And please tell Siddy that he has a big fan in rural Oxfordshire. I agree totally – every person who influenced me through this latest episode is a blogger, I think that is pure magic! Orlando is accepting hugs from everyone these days, so have no fear of rejection. Siddy takes it for granted that everyone loves him – doesn’t occur to him that they would not. Isn’t that an amazing way to be? Ah, to have self-esteem like that… Although maybe it wouldn’t be quite as endearing in a person as it is in a dog. I actually think the time I ‘just sit and think’ is rather time well spent. Maybe we don’t have to be productive at every turn. Maybe just soaking in what we’ve built so far is important. It’s a good to rejuvenated sometimes. That being said, nice to set goals. Knowing you’re going to arrive somewhere’s spectacular makes the trip so much more fun. I’m glad you left feeling inspired Boomdee – heavens knows you inspire me often enough! We nursed Orlando through his bout successfully and now he is quite well again. I just need to be more vigilant to keep him safe. There must be something in the air. I stirred myself to do some weeding today. 🙂 Can’t wait to see Siddy’s new look. Poor Orlando having to suffer so. How undignified. I am glad to hear you are stirring. Take your time and let it be what it is. You will soon see the new improved Siddy. Poor Orlando – he was most unwell and most upset. I had never heard him cry before! It is heart-wrenching to hear an animal cry. Special pats to Orlando. Wow … awesome post … and the paragraph following the Charles de Mint quote is very powerful! … thus I’m touched to think of the small role I played in the post. … so in more ways than one, thanks for the magic. No, thank YOU Frank! The magic is in seeing how all these activities and words and people all came together to make one small epiphany happen in a far flung corner of the globe. Imagine how often it is happening all over the place – we never know how we influence and help others while simply doing what we do and being what we be 🙂 You gotta love blogging!! A definition I read of magical said, “beautiful or delightful in such a way as to seem removed from everyday life.” This is you, Pauline! You’ve already got the magic and this lovely post proves it. I’m happy Orlando is back to his mischievous little self. 🙂 Oh yes, if I lived closer, I’d happily dog sit for my pal Siddy. Enjoy the rest of your week, Pauline! I’m going to echo several others. I love this post. ♥ I love the poem, too, and the idea of memorizing one that touches the heart and soul. Thank you for the shout-out. I love this post, Pauline! There’s so much to think about and respond to. I also love to hear that you are getting back to your life of creating. I agree that sitting and thinking and contemplating is important for us all . . . but then it’s time to move ahead. I find, for myself, that getting started is the most difficult part. It’s that whole thing about an object at rest staying at rest. Once I BEGIN, I keep moving. And Yeats reminds us that we have to GO to get to Innisfree–it won’t come to us. On a more family note–so relieved to know that Orlando is okay! It IS wonderful these blog interactions gain momentum and become more than the sum of the parts! My very favorite thing about blogging is having found people like you! Thank you Granny and Little Binky ❤ ❤ Orlando is quite recovered and enjoyed your smoochie! My garden is taking off quite well, I made lots of compost over winter and am sure that has given everything a great start. I am enjoying the magic!! Has it been three months Anne, all this renovating? Makes you appreciate why folk just sell and move on. Are you going with the flow or hanging out for your life to resume? It will be lovely to read your words again and see Monty happily running about! Orlando has quite recovered and is completely back on form. He was teasing the puppy mercilessly this morning! Siddy is a different boy with his haircut – I don’t know why I waited so long! I hope Siddy behaved himself. Max (Lhasa apso x terrier – exactly the same look as Siddy) is so naughty at the groomers that I have to go with him to hold him down! I hope your magic grows and grows and flourishes into beautiful creations and profound contentment. Max is big – about 12kg I think. 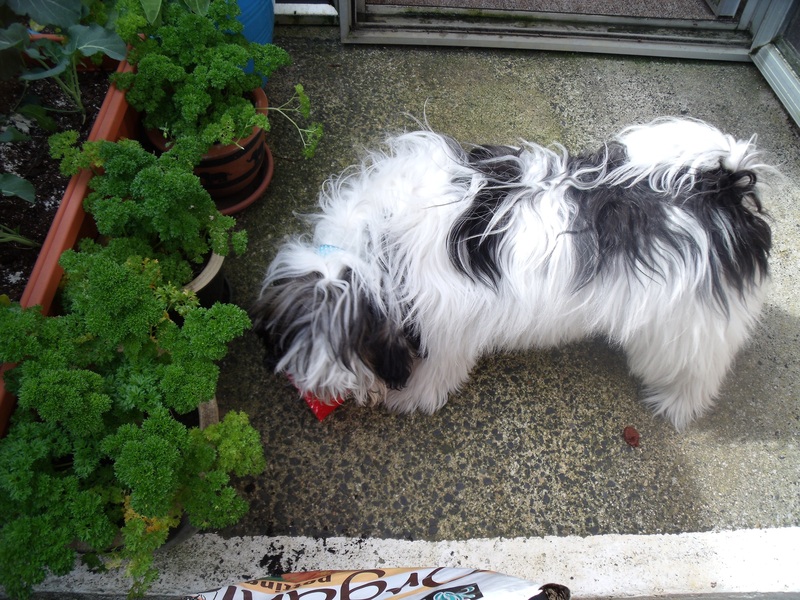 We used to have a terrier x Shi-Tzu and she was about half the size… and much less naughty! Max is white and tan, but when he’s had his hair done he looks rather like a Moomin and very camp… and then we refer to him as the Snork Maiden! 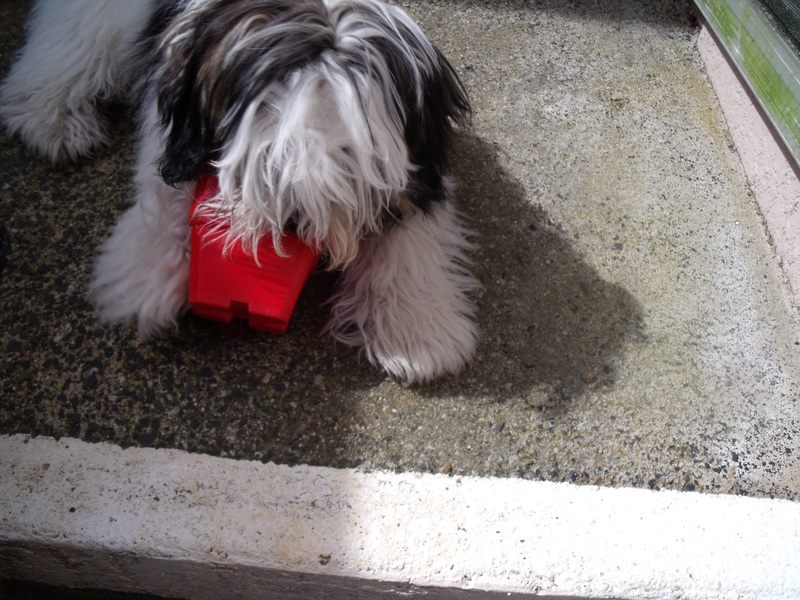 I have to say that he has got better over the years about being groomed – he’s nine now and we’ve had him seven years – but he was maltreated as a pup (he came from a rescue) so goodness knows what trauma he’s had in his background. Poor Max – the Snork Maiden! 😀 So now I’m thinking my boy can easily double in size, he’s only half way through his growing time. Max is most blessed to have found a loving and accepting home! I can only say that this is a magical post, Pauline! I love that Yeats poem too – and well done you for throwing down your goal and setting to till the end of the month. I read that post too and am still procrastinating over it! I also love the Buddha in your garden. Well, Ms. Pauline, you are magic…you are walking magic:-) Everyone adores you for you are a beautiful moonbeam in this world:-) Your garden is looking beautiful and it seems to be making you happy,too! I see parsley. I see lettuce. I see arugula + food for your magical soul!!! Just remember you don’ t need to want…you are! Robbie ❤ ❤ ❤ My courtyard is full with all kinds of yummy salady foodstuffs and sweet peas and petunias and lobelia and all manner of herbs. There is nowhere left to sit!! 🙂 My first very quick visit back here for a wee while and I find you have had an epiphany!! I can really relate to this Pauline and love the quote (love, love) and the poem. Sometimes I can spend days just sitting and thinking, sometimes I wish for magic…. The quiet times soothe the soul and then I can feel the magic that is already there if I just take the time to become aware of it. We are always somewhere in a process of becoming aren’t we! I love these times when I am jolted back into the mystery of life and I am so glad I decided to share it here today – look at all these fabulous women who know exactly what I’m talking about 🙂 [I am hoping for a fabulous man or two to drop by also who will get it and join in with us 🙂 ] I had to look the quote writer up – he is a Canadian novelist and fantasy writer and now I want to read some of his books! Yes, we are 🙂 🙂 It’s certainly lovely and his books would be nice to read, any man that writes words like that has got to have something special, the “magic”. It’s funny because years ago I used to fear the times of what I thought was just sitting and stewing but now I embrace them – it’s doing what the body and mind needs at the time and I enjoy now seeing where it takes me. When I got to the paragraph that ended with the line “I know these things, I just don’t always allow myself to live in them and with them” I jumped up, pumped a fist in the air and yelled “YES!” We definitely need to be more intentional about acknowledging/embracing/celebrating the magic in our lives as well as in our splendid selves! And I may be a bit biased, but I think it was BRAVE to take the VOW – because we both know that making that public declaration will obligate you to do what you’ve been wanting to do in a finite period of time. I’m looking forward to celebrating your finished piece and my well-oiled, well-ridden bike at the end of the month!! I’m loving our new connection – your blog post was the icing on my epiphanic morning! Your fist pump made me laugh out loud, there we all are missing the wonderful stuff and ourselves in the process. Let’s keep each other on track!! I think your commitment to get your bike up and running and to actually ride the thing is way tougher than my pledge to complete a half finished painting and I really, really want you to not only fulfill it but go further than!! And be so freakin’ pleased, proud and happy you’ll be fit to burst!! You learned Jabberwocky!! All I can remember is ‘Twas brillig’ and the rest is mumbled under my breath. Well done you! You know it is very good for the memory, so we should just keep on learning more and more! I had such trouble getting the first lines of Innisfree, it took a couple of weeks – and then the rest went in in one day. Poor O, I hope he is feeling better! Almost 100% again. Where have you gone? I’ve been missing your posts! lovely lovely post Pauline! I especially like the reminder that procrastination is a cover for fear – I needed that! Also I need to spend more time admiring moonbeams – reflection and attentiveness are all part of the creative process 🙂 ps Siddy is a cutie. That line on procrastination got me too, Yolanda – I have a magical opportunity awaiting me that I keep putting off and I really didn’t realize why until I saw that – and the REAL reason I’m procrastinating was driven home! Thanks, Pauline! Thank you Yolanda 🙂 I think this is one of the things women do for each other – the listening and sharing and questioning that allows us to have the vital ‘Aha!’ moment. We know it and just need to be reminded now and again. Yes to admiring moonbeams!! 🙂 Siddy is the best puppy ever and most certainly cuter than ever with his new hair cut! Oh, Pauline, how very appropriate. I have been procrastinating and sitting in deep thought as well. The days feel very odd like I’m in a transitory state and I’ve given in to it for a bit. Sometimes we need that down time because so much has been coming at us that we just need to absorb. I’m finding my way back to them as the timing becomes right. I’m letting things flow more than force them. Flow works so much better. I’d love to see Siddy with his haircut. What on earth is the spray poison? Poor Orlando. I hope he is better.Love the beautiful thoughts here and I want to be magic too. Hugs. You have been working so hard on your house and garden Marlene you may well be in need of some down time! I have also found with myself that after a long anticipated event – me retirement, you your own home – there is a flat lining that happens for a while. It’s all part of the process. Do you think that might be happening for you? Flowing sure is preferable to doing battle against the current I agree! Orlando is nearly 100% again. I have taken photos of the most handsome and very white Siddy and will pop them up on a post in a day or two. Yay for Orlando. Yes, I think there may be a bit of flat lining going on and the realization that I can’t do it all this summer. Trying to push through has caused an exacerbation of the dizziness. Going for a massage tomorrow. They are essential to my health. 🙂 I realized I made outrageous lists of things to do and totally overwhelmed myself. So now the downtime lets me put what must be done and what can wait into perspective. I know you are doing the same. Hugs to you and chin scratches to your furry family..
Have a magical month painting moonbeams and dancing on clover!